The most popular attraction in Juneau is the Mendenhall Glacier, located just 12 miles (19km) from the downtown area. Originally known as Sitaantaagu ('the Glacier Behind the Town') by the Tlingits, it was renamed in honour of Thomas Corwin Mendenhall, an American physicist, in 1891. The Mendenhall Glacier is 1.5 miles (3km) wide, and calves into its own lake. Visitors have several options for seeing the Mendenhall Glacier. 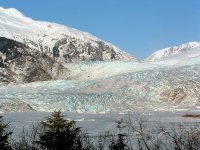 It can be viewed from the Mendenhall Glacier Visitor Center, which includes a recreation area good for viewing black bears; or you can hike to the glacier via the Mendenhall Glacier West Glacier Trail, which takes roughly five hours both ways. It is a good idea to hike with a guide, and bring crampons if you want to hike on the glacier itself. As an added option, several businesses in Juneau offer helicopter rides to the glacier itself, although these are fairly expensive.